I’ve dreamed about visiting Israel for almost forty-five years, so when I got the chance to visit there recently, I jumped at it. It’s a funny thing about dreams, especially those you’ve held in your heart for almost a lifetime. In their realization they can go spectacularly wrong, but sometimes…. sometimes… they go spectacularly right. Travelling alone (I will blog about that at a later date) I joined a ‘Holy Land’ tour of Israel which took us to most of the expected sites – Bethlehem, Nazareth, The Dead Sea, The Sea of Galilee, Jerusalem, The River Jordan – but the absolute highlight of my trip was our visit to Masada. My knowledge of ancient history is woefully pitiful. I’d heard of Masada – I knew vaguely that some kind of massacre had taken place there – but I wasn’t prepared for the effect it had on me. It truly touched my soul. 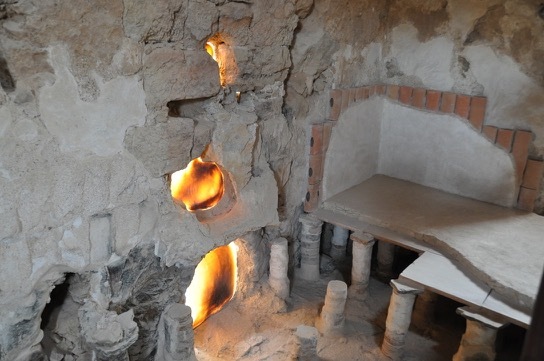 Built with luxury in mind, note the double floor on the steam room and the remaining evidence of frescoes on the walls. Although his family spent time there, Herod himself never actually visited the fortress, which was built with both protection and luxury in mind. Temperatures in the desert can reach 50+C in summer, but one part of his private palace was built in such a way it catches a gentle breeze rippling up from The Dead Sea. 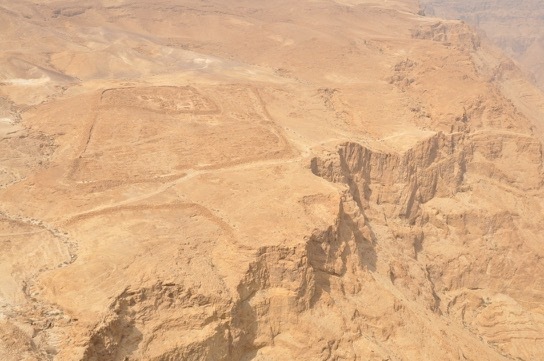 Most people have heard of Masada from the attack on the fort by the Romans in 72AD. Instructed by the emperor to put down the revolt by Jewish Zealots, the army commander, Silva, had a limited time span to take over the fort. He knew his army of 6,000 soldiers and 10,000 slaves would not survive the summer heat of the desert in a long siege. So he first created a supply route from Jericho to Ein Gedi to the eight camps that surrounded the base of the Masada. In the autumn of that year he began his siege, with his slaves building a massive earth ramp up the mountainside. Once it was completed, a battering ram was pushed up the ramp to break down the fortress’ wall. The remains of one of the Roman forts surrounding the fortress at Masada. With plentiful food and water to allow the Jews to withstand a siege of several years, how was Silva successful? The slaves building the ramp were Jews who had been captured in Jerusalem. If the Jews in Masada had poured oil, thrown rocks or shot arrows at those slaves, they would be killing their own. So they had to watch day after day as the ramp grew larger and closer. 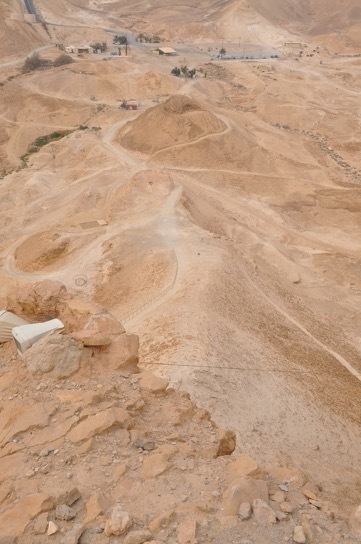 The earth ramp the slaves built up to Masada. Silva breached the walls late one afternoon. Fearful his soldiers might be walking into an ambush in the dark, he decided against entering the fort until the next morning. Knowing his people were facing imminent crucifixion or slavery, the Jewish leader, Elazar Ben-Yair, called his men together and they decided to die at their own hands rather than be captured. The men killed their wives and children, then a lottery was held – 10 men were chosen to be the executioners of the rest, with one man left to commit suicide once everyone else was dead. When the Romans arrived next morning, it was to find a place of death – except for two women and three children who had hidden to escape the slaughter. The Romans allowed them to go free.